The usage of forearm and elbow as tools during a massage session is a legitimate therapy option. The reasoning is very simple. If we can use forearm and elbow during a session it takes less of a toll on our hands and especially thumbs. I completely agree with this notion, however, there are some CEU programs that teach therapists to use forearm and elbow as primary tools of a massage session, practically avoiding using hands altogether in fear of damaging them. While I agree that the forearm and elbow are useful and, in some instances, indispensable tools in our profession, it is wrong to think that a therapist can perform the most effective therapy without using hands as the primary tool of application. The human hand is the most versatile tool in our arsenal and as such, it is simply irreplaceable. 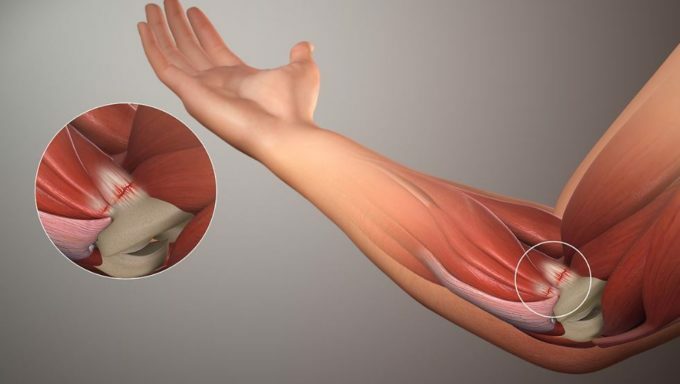 Using the forearm and elbow can definitely ease the load on therapists’ hands, but our profession relies on valuable manual techniques that cannot possibly be reproduced by the elbow and forearm (e.g., various types of kneading, percussion, Connective Tissue Massage, etc.). If the forearm and elbow are a therapist’s primary tools it significantly reduces his or her technical arsenal and makes the entire massage session a primitive and mechanistic combination of gliding strokes and compressions. Ironically, the therapists who extensively use the elbow to protect their hands in equal degree are prone to the incapacitating professional injuries in the elbows. I am a great example of this unfortunate situation, so I would like to share my experience with readers. I’ve been a full-time massage therapist since 1996. I graduated from massage school with a limited number of skills. I was taught the basics of effleurage, petrissage, tapotement, compression and percussion. Body mechanics was not properly taught in my school, and in retrospect, that started me on the path to injury. After graduating, my rudimentary skills were good enough to get me hired at a local day spa. I also did home visits and chair massage in the corporate environment 2 days a week. I always tried to work stronger, deeper, more intensely on my clients and most of the time I was told my work was so great because “you are really willing to get in there.” It became a point of pride for me and I looked forward to hearing my clients say no one had ever worked on them that deeply before me. This is when I started to have issues. Working this much and this hard without using proper body mechanics started to take its toll on me. My back, my shoulders, my arms and hands all began to suffer. Even though I was in excellent physical condition my body was not able to deal with the stresses I was imposing on it. I developed chronic low back pain, my shoulders always ached, and my forearms and hands hurt so much I would soak them in a 5-gallon bucket of ice water at night. Even though I was working steady, I still studied and sought more knowledge. I read books on Oriental Medicine, Myofascial Release and Neuromuscular Therapy to name a few. I was still using my hands almost exclusively since I never thought about using my elbow. My watershed moment came when I purchased a set of instructional videos from the St. John Institute of Neuromuscular Therapy (on VCR, this was a while ago). In the videos, the instructor, Paul St. John, showed several instances where he used elbow. I was intrigued, and I started using my elbow on the back, in the lamina groove and along the top of the sacrum and iliac crest. The response from my clients was very positive so I continued to use my elbow and started using it even more. I would use my forearm for flat, strong effleurage on the back and the extremities regularly. I thought I’d found the ultimate tool. It no longer mattered how big or strong or tough my clients were, I had the tool that could do the job. I used my elbow in virtually every treatment over the next several years. I developed my abilities, I could change angles effectively, I could gauge pressure effectively, I could transition from the forearm to the elbow and back among other things. I used my forearm for deep flushing, sawing friction and could even do a little kneading on the glutes. While this definitely gave my hands a rest, it also caused me to neglect using them to their full abilities. I was pretty much just using them for applying lubricant and occasionally for trigger point therapy, which I was performing with my elbow most of the time. Everything was going great! Then I started to have issues again. 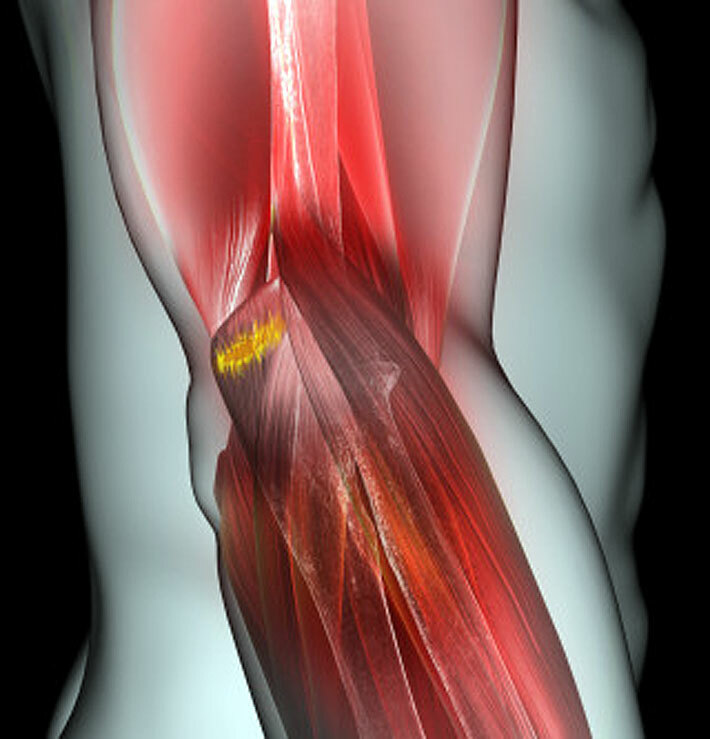 I was working a client’s SI joint, holding steady, strong pressure on the SI ligament when I started to feel a sharp, intense pain right on the tip of my elbow. I released pressure and moved on and it seemed to subside. The next time I used my elbow I felt the pain again, except this time it was more intense. I couldn’t use the tip of my elbow, a periostal trigger point hand formed on the tip of my olecranon process. This was still before I’d been exposed to Medical Massage, so I didn’t know how to properly deal with it. I still used my elbow, but I worked around the pain. After a few weeks the trigger point subsided, and I went back to my normal routine. This continued to happen a couple times a year, mostly on the right elbow (I’m right handed), but it happened on my left elbow as well. Each time it happened I used a different part of the elbow and worked around the pain. By now I’d been introduced to Medical Massage and was realizing how much more you could accomplish if you learned the concept and the various manual techniques. I was also exposed to the correct Body Mechanics at this time. I studied hard and practiced and learned the techniques, but I still used my elbow regularly, against my mentors’ advice. The next injury I suffered was much worse. I ruptured the olecranon bursa in my right elbow. First, I noticed my elbow felt funny, sore but not really painful. The next morning my arm had swollen to at least twice its normal size. Needless to say, I freaked out. I went to my doctor and he drained my elbow twice in 5 days. I took a week off and tried to return to work. That was wishful thinking. Not only could I not use my elbow, I couldn’t put pressure on my arm or hand at all. It was 8 weeks before I returned to work, and it took 6 months before it felt healed. You’d think I would have learned my lesson, but as soon as I thought I could, I started using my elbow again. Not quite as much, but still regularly. This continued for a couple years until my next injury began. I started having pain on my right medial epicondyle when using my elbow while in full flexion. Initially it would subside if I opened the angle, but eventually it started hurting all the time, even when I wasn’t working. It got worse over time. I started having regular therapy and even injections, but whatever I tried only provided temporary relief. XRay showed bone resorption at the tip of the medical epicondyle of humerus. I continued to work through the pain. Finally, it got to the point that I couldn’t use my arm for anything without pain. I got an MRI and it showed I had a 12mm high grade tear of the right common flexor tendon. Now, surgery was the only option. I didn’t have an answer, but this though continued to bother me. At home I did some basic internet research and I found that according to Arizona Massage Therapy Board there are approximately 3,300 therapists with active licenses in Phoenix. At the same time, according to Phoenix Bureau of Labor statistics, there are more than 17,000 construction workers in the same city. Why does my surgeon conduct more elbow surgeries on therapists than on construction workers who are supposed to be inclined to this type of injury? Was it because we work so much with our elbows? After surgery the surgeon met me in the recovery room. He said the procedure went well, but the injury was much worse than the MRI indicated. The common flexor tendon was completely torn, so my recovery would take significantly longer. He told me I should not perform any massage therapy for a year. their tendons at their insertion into the medial epicondyle or you overload extensors and detach their tendons from the insertion site in the lateral epicondyle.” Two pictures below illustrate the pathophysiology of Lateral (a.k.a. Tennis Elbow) and Medial (a.k.a. Golfer’s Elbow) Epicondylitis. It has been a year since my surgery. I’ve done a lot of rehab and exercise to get myself back in shape for work. I can do 2-3 appointments a day with breaks in between 4 days a week. I used to do 30-35 appointments a week. I don’t think that my situation is unique, and it looks that professional elbow injuries are not uncommon in massage therapy. This is my word of caution to all readers especially fresh from massage school: the elbow and forearm are wonderful tools and can extend your career if used appropriately. However, if you choose to use them as your primary tools it can cause lasting damage that can potentially be career ending. 2. Learn and incorporate the various manual techniques in your therapy to decrease the harmful impact of pressure by alternating usage of different parts of the upper extremity. 3. Go ahead and use your elbow and forearm but use them in an appropriate and cautious manner.